The strange appearance of a supposed Nexus 5 in the video presentation of Bugdroid “KitKat” for Android 4.4, gave ideas to S4Gru. The U.S. site had fun to go rummaging through the records of the Federal Communication Commission (FCC, roughly equivalent to french ARCEP) and found strange documents relating to an LG smartphone, the D820. If the the authorities documents tell us that the phone will manage the 4G, they are especially interesting in view of the famous KitKat video. 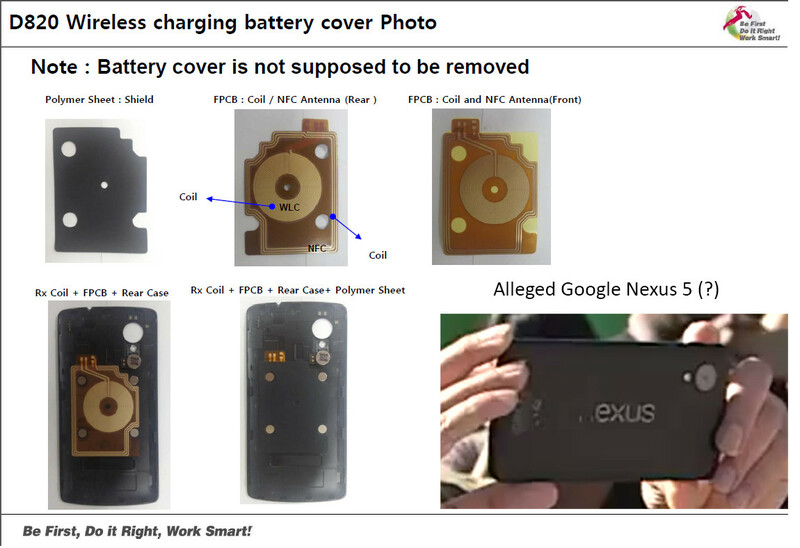 The images shown therein including the back of a phone with a particularly wide for the camera sensor port side. Just as the one who stole the show at the mascot KitKat. The image above, taken from a section detailing the device’s Qi wireless charging capabilities, shows the inside of the back cover. When comparing it to the phone revealed at the HQ slip-up, the two pictures line up incredibly well. The D820 also features 7-band LTE, some of which are compatible with AT&T, T-Mobile and Sprint (bands 2/4/5/17/25/26/41), CDMA / EVDO rev A, pentaband DC-HSPA+ and quadband GSM / EDGE, Bluetooth 4.0, NFC and dual-band 802.11 b/g/n/ac. That’s an amazingly healthy list of specs for your usual FCC submission, and the list of LTE bands is quite stunning as well. If it’s not the Nexus 5, it’s certainly going to be one heckuva flagship. Question is, how much doubt do you have? As usual, we leave you with the docs for you in case you have a burning desire to do some digging yourself. In other words, it would seem that Google has left – voluntarily or not – reveal the Nexus 5. Update: In one of the docs there’s: an admission that the phone is running firmware M8974A, and the software version listed is “aosp_hammerhead-userdebugKyeLimePieFACTORYeng.sangjoon84.lee.20130618.015154.” The firmware seems to indicate a Snapdragon 800 SoC, which wouldn’t surprise us in the least, and the software appears to suggest that it’s running KitKat (Key Lime Pie), weird typo aside. 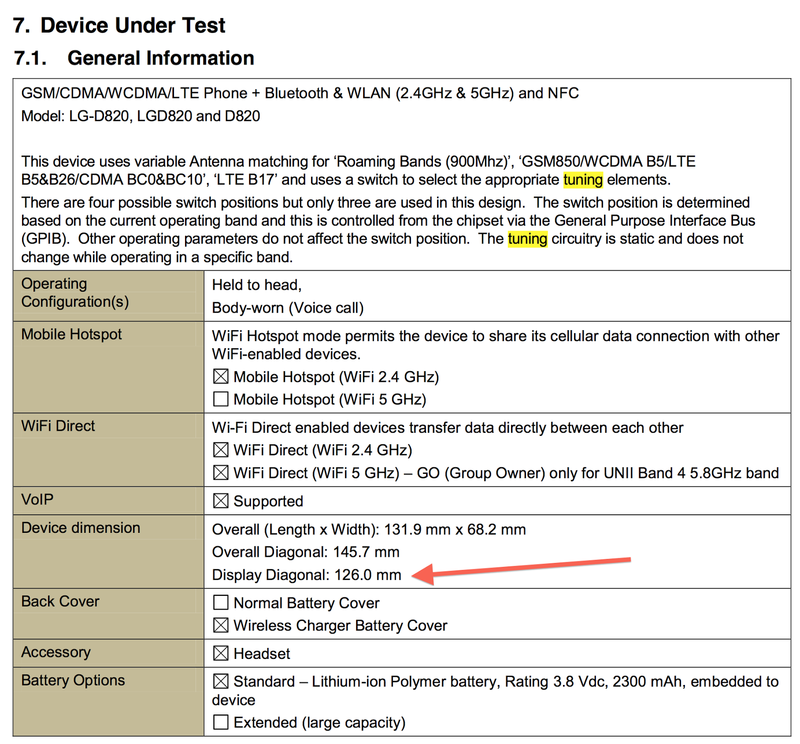 Update 2: In a good catch by Brian Klug from Anandtech, the docs also clearly indicate that this device will have a 5-inch display (4.96-inch, to be exact), and measure 131.9mm tall and 68.2mm wide. Check out the screenshot after the break, and let us know your thoughts of the device. We’ll keep you updated if we hear anything more concrete. In the meantime be sure to check us out daily as we covering the event second by second. For more, head to our Facebook page and throw us a like or follow us on Twitter or add us to your circle in Google + so that you won’t miss out any breaking news.